How do you make the best thing in the world even better? That’s the question Danish design firm Menu set out to answer, and they came back with the world’s first beer foamer. No, not the loads of foam you get from a bad pour -- we’re talking about a dense, fresh-from-the-tap, cappuccino-style foam. Good foam makes beer taste better, and Menu’s foamer gives a bottled or canned brew a draft-style head. In just 30 seconds, the Beer Foamer turns your good-but-okay bottled beer into an amazingly crisp, draft-style brew. It’s outrageously easy to use, and you look like the ultimate beer connoisseur when using it. 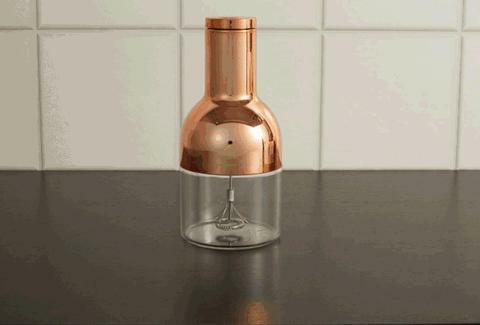 Plus, the thing just looks good -- it's made of shatterproof glass and copper, inspired by boiling tanks in old breweries. Step 1: Pour a quarter of an inch of beer into the container, and the rest into your drinking vessel of choice. Step 2: Put the foamer on top of the container and press the button down for about 20 seconds, until foam rises. Step 3: Take the copper top off and pour the foam on top of your beer. Step 4: Enjoy your beer 'stache.